War Child Holland is part of an international network together with War Child Canada and War Child United Kingdom. The three foundations are also registered in several other countries for fundraising purposes. The network’s goal is to improve the overall quality and efficiency of War Child’s work. To that end, the organisations collaborated in projects in several field locations, but remain legally, financially, and administratively independent foundations. In 2013 good progress was made toward aligning the work of the different War Child organisations in the field. For example, War Child UK contributes to War Child Holland’s response to the Syria crisis in Lebanon, which has reached more than 50,000 Syrian children. War Child UK also started a programme in Jordan for Syrian refugees, for which they pulled from the expertise and experience gained by War Child Holland in Lebanon. The two organisations also decided to work more closely together in Afghanistan, where War Child Holland will hand over its programme to War Child UK to increase efficiency and decrease operational costs. Overall, War Child Holland and War Child UK are working to foster further cooperation and align or hand over programmes wherever possible. Together, War Child UK, War Child Canada and War Child Holland have developed guidelines for when, where, and how the organisations should collaborate in the field. We also cooperated with our counterparts in the UK and Canada, resulting in more efficiency (such as shared office and overhead costs), joint applications for funding opportunities, joint advocacy reports and other initiatives. 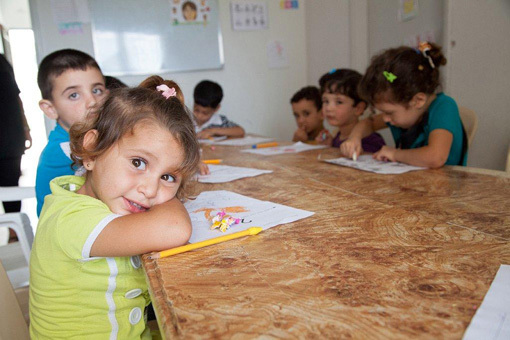 War Child UK contributed approximately € 33,000 to War Child Holland’s emergency response projects for Syrian refugee children in Lebanon. In Uganda, all three organisations collaborated to implement grants from UNICEF and other donors. In addition, the three organisations developed a joint project for South Sudan, funded by the IKEA foundation. Project activities will start in 2014. Increasing efficiency would require the three War Child organisations to more actively communicate when developing their strategic and annual plans, allowing for better alignment in both programming and fundraising. Although each of the War Child organisations work under the same name and logo, they have different strategies for fundraising, programme implementation and advocacy, which can lead to tension. In 2013, War Child Holland and UK disagreed a number of times on how best to communicate about issues key to our work, but about which, communication may pose risks to our staff. These issues were resolved through open communication and cooperation, but the possibility that these disagreements may recur remains. Work will continue to further develop War Child International, including the development of common operating guidelines, in 2014.